There are many parasitic cones located to the northeast of the mountain peak and there is a small section in the southwest part of the mountain. There is a melt of lava in the western part of the mountain plain. In addition there are small craters due to volcanic eruptions in the west and north. The first time Mother Mountain was known to erupt occurred from August to September 1911. There was no explanation of the type and impact of the eruption. The next eruption took place 87 years later, in December 1998 which produced lava plugs. 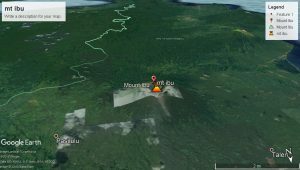 May – October 2001; Satellite data shows the volcanic activity of Mount Ibu during May – October 2001. A photo taken in May 2000 shows a lava dome covering the base of the crater. On April 21, 2008 at 4:00 p.m., the status of Gunung Ibu was raised from Waspada (Level II) to Standby (Level III).